What does the expression "to sharpen fritters"
Stair railings are not only a decorative function. They attach ladder design for extra rigidity, also serve as railings for the safety of people using the stairs. Therefore, the stair railing should be strong and durable to fit style decision all stair group. Stair railings consist of a handrail, which is placed on the support columns - balusters. Wooden stairs, handrail and balusters must be made of one tree species. Changes in environmental conditions during the operation of the ladder should equally affect all parts of the structure, in order to avoid distortions and cracking. For the manufacture of wooden staircases using wood solid wood: oak, larch, ash. 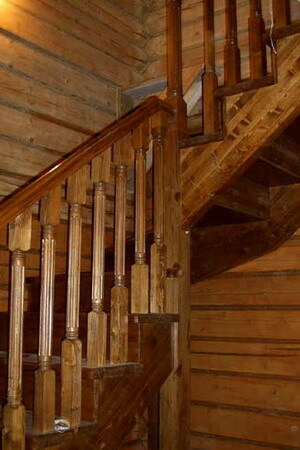 Balusters are installed on the stairs at regular intervals. The clearance between them is regulated by building regulations. Support poles for the ladders are a reference, and the starting corner. Used for the manufacture of glued from two longitudinal parts of the block. Sometimes for strength inside the support railing is inserted into the metal pipe. Standard balusters have a thickness of 30-80 mm, and a height of 800-900 mm., Their shape may be different because they do not bear structural loads. First of all, for fastening balusters to accurately mark the location of its installation. Manufacture from wooden bars, two round peg (pins) for fastening balusters. The diameter of the peg must be at least a quarter of the thickness of the balusters, and the length not less than two diameters. Put the peg in the hole steps on the glue. Repeat the same procedure with the upper peg for attachment to handrail. Install the cover to the handrail. Installing balusters can be done also in the bottom groove of the rail, cut to shape and size the top of the balusters. Then between balusters you have to hook the bar that locks them into a certain position. For fastening use nails without hats.